It is not too often when one can experience a 3 star Michelin Restaurant. In 2011 only 93 restaurants in the world were awarded three stars. One of them is in the culinary Mecca city of Las Vegas at the MGM Grand Resort. Joel Robuchon. Winner of Michelin’s Three Star, Forbes Five-Star, AAA Five Diamond, and Wine Spectator’s Grand Award. 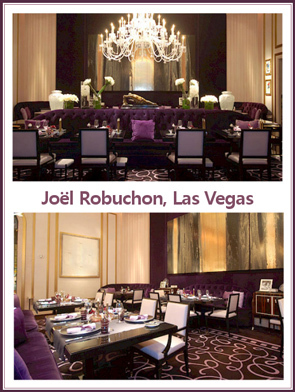 Joël Robuchon was named France’s Chef of the Century by the esteemed Gault Millau restaurant guide. He accumulated a total of 26 Michelin Guide stars the most of any chef in the world. To have the opportunity to sit with this Iconic Chef was an honor beyond description. Walking into the palatial, elegant and simply beautiful restaurant would elevate anyone’s pulse rate. Taking a seat on the luxurious trademark purple couch was just the prelude of an experience of a life time. The door opened and there he was, the Chef of the Century, the Mt Everest of the Culinary World for literally the last century. 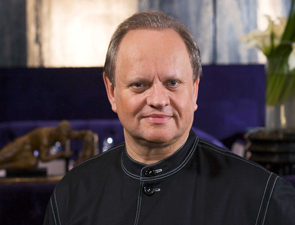 Chef Joel Robuchon. This very classy, humble and gracious legend took his place on the couch with Bonjour and a welcoming smile. SH: Mr. Robuchon you have been noted as the “Chef of the Century”. What does that mean to you personally? JR: I appreciate the accolades and the distinction that comes with that. But it also drives me to justify the honor in the future. I must question myself everyday and inspire myself to work harder. SH: You went in to retirement and then came out to open new restaurants of the highest caliber in the world. What made you reconsider retirement when you could have relaxed and enjoy life? JR: Cooking is like a drug and I just couldn‘t leave a big part of my life. I had people that have worked for me over 20 years and they wanted to open restaurants of their own but they could not get funding from the bank because they had no reputation or recognition. They reached out for me for help .It was because of this the L‘Atelier concept was born. It is a convivial way to dine and this is what people are looking for today, a fun, exciting, relaxing experience with great cuisine. For my whole career I was alone and all of the stress of the Restaurant fell on me. Now I have six Chefs that help and support me. It is not so stressful when six people are all working together. SH: What do you look for in a Restaurant when you visit it for the first time? JR: That is an excellent question. The first thing I look for is the ambiance. Is it warm? Is it welcoming? Is it convivial? Is it comfortable? I also look at the service. Does it make you feel good? Is the service friendly and kind? At this point is it not that important if the fork is on the correct side of the plate. The quality of the food of course is very important but not as important as service. SH: What is your vision of the newest culinary trends like Molecular Gastronomy and what traditions should we retain? JR: Molecular Gastronomy is over and it should be. Doctor studies have shown that some of the additives can be bad for you. It did bring is positive things like the techniques that are used. You are what you eat and you must eat healthy. Recently I was invited by Larry Ruvo in Las Vegas is visit with Doctors at the Brain Injury Center. They have shown that good food and a change in diet can help people with Brain injuries improve greatly. I do my own part in using good ingredients like fruit juices and fresh rosemary. We reduced the fat we used in our dishes 20 years ago by 75% today. It‘s about using good ingredients, making simple food and less blending. SH: In closing, what advice would you give a student in culinary school or someone who wants to study to become a Chef? JR: Cooking is a job of passion. If you don‘t have passion you will not be successful. Passion comes from love of people. When I see one of my cooks making something that is improper I ask them would you cook like that if it was for your family? They say of course not. I tell them that the first key is to cook for your guests like you would for family and show that you care for them. The second key is you must respect what you cook. When you cook you take a life like fish and meat. You must respect the food and make the best dish you can. To cook and be successful, you must have a love of people and respect the food. After spending some time in conversation with an Iconic man like Joel Robuchon one cannot just be impressed with the Chef who has won all of the accolades but with the man, Mr Robuchon. He is confidant, classy, warm, friendly and inviting. The next time you visit Las Vegas and want an experience that you never forget, Joel Robuchon at the MGM Grand would be an excellent choice. Your experience will be warm and inviting with world class dishes and unmatched serviced inspired by the Chef of the Century, the great Joel Robuchon himself.